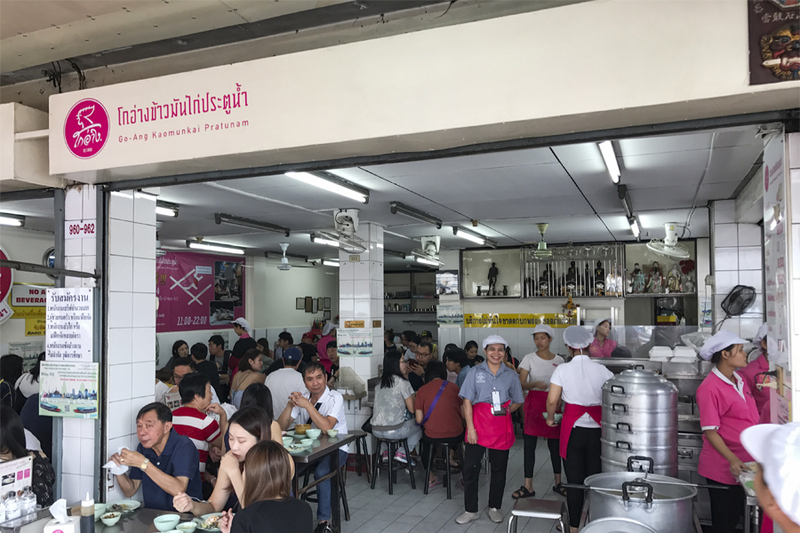 [Bangkok] Known to serve the best Hainanese style chicken rice in Bangkok, Go-Ang Kaomunkai Pratunam is also awarded a Bib Gourmand in the inaugural Bangkok Michelin Guide 2018. 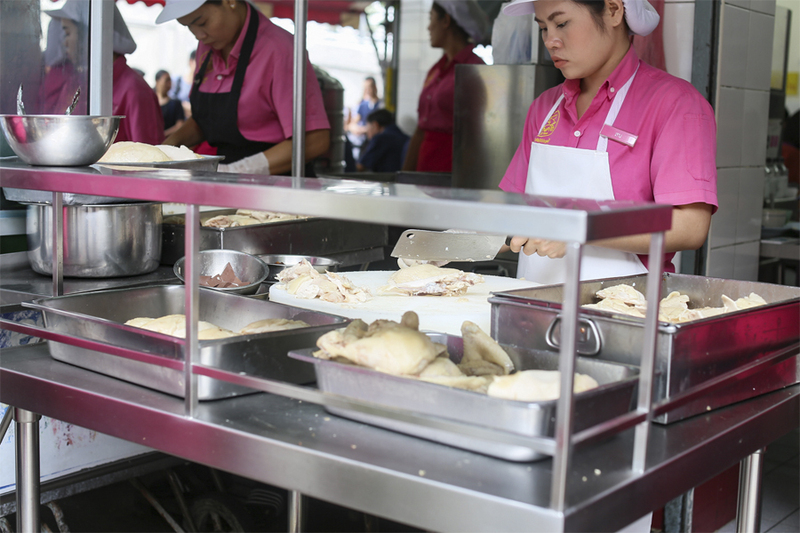 Located right in the heart of Pratunam District, Bangkok’s shopping haven, the chicken rice eatery is a 5-minute walk from the Platinum Fashion Mall or The Berkeley Hotel. You will find it along the lane Petchaburi Soi 30. 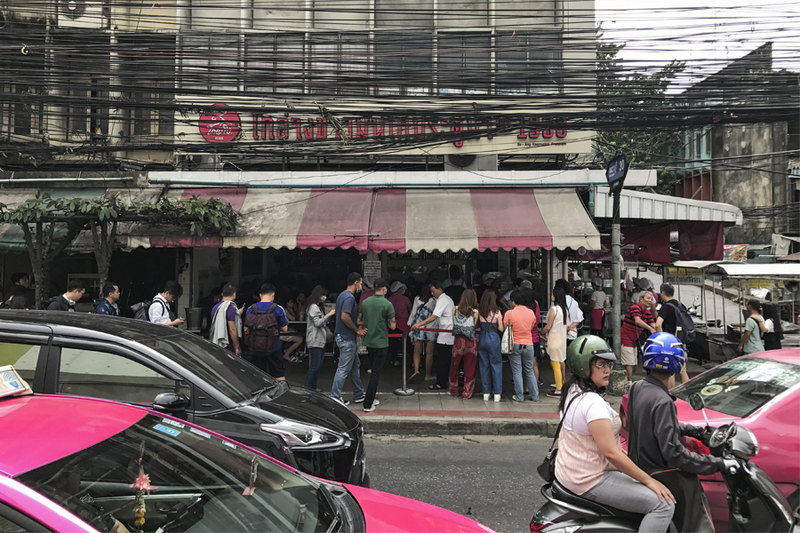 Once you are in the vicinity, you can easily spot the place since it should have a long line of customers queuing, and staff in pink-coloured uniforms serving or doing crowd-control. I queued for about 15 minutes or so, joined by largely Japanese and Singaporean tourists. After having a plate, I understand why Singaporeans would queue for a dish they could easily get at home. The dining area is like a typical coffeeshop, with stainless steel tables and plastic stools. It does not have air conditioning but only ceiling fans. It might get too warm inside the place, especially if the place is packed with diners. Anyway, wear light going there (then go Platinum Mall for some shopping). 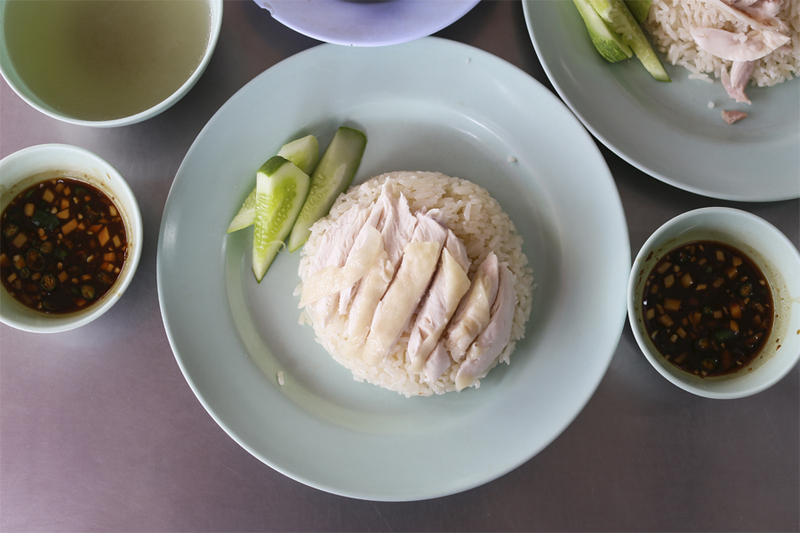 Go-Ang Pratunam Chicken Rice has been around for more than 40 years, and offers Khao Man Gai (ข้าวมันไก่), a Thai version of chicken rice that originated in Hainan, China. 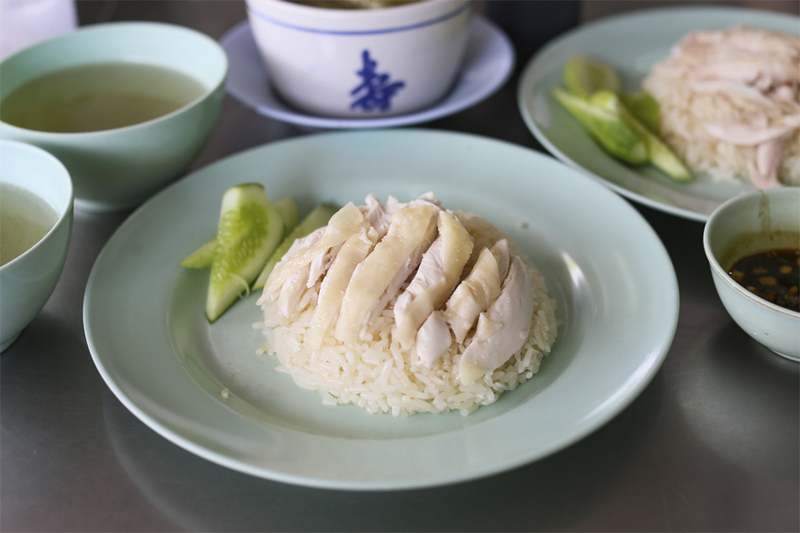 Some consider the Thai-style chicken rice less oily than the Singapore version. 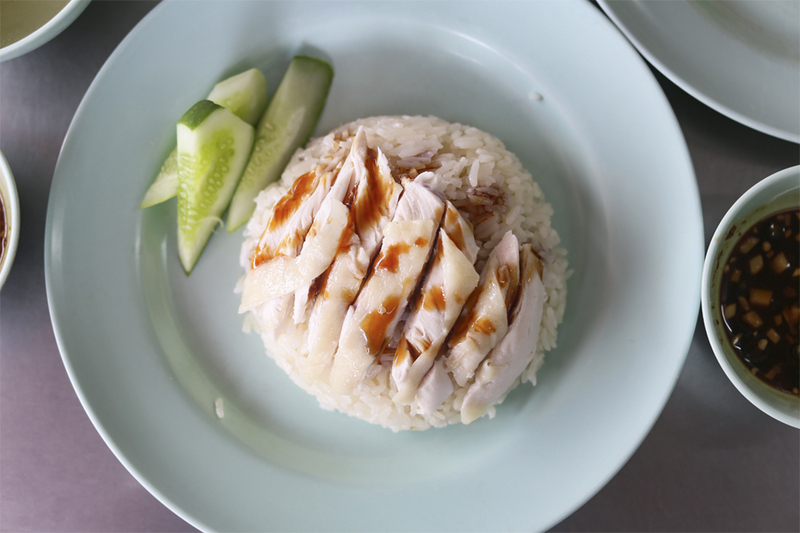 A plate of the Hainanese Chicken Rice is priced at an affordable 40 baht. That is SGD$1.65. 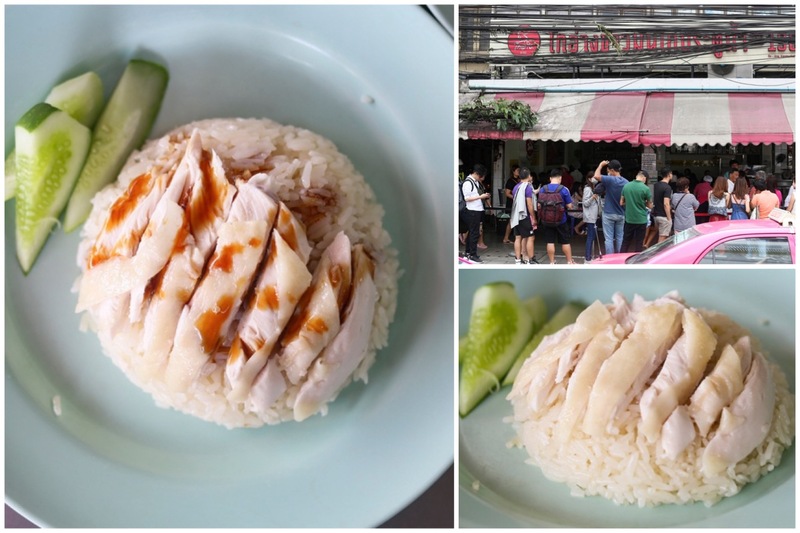 Coming from a Singaporean, the quality of this chicken rice wins several of the average stall here. Even if I want to pay double the price, I may not be able to find such quality. 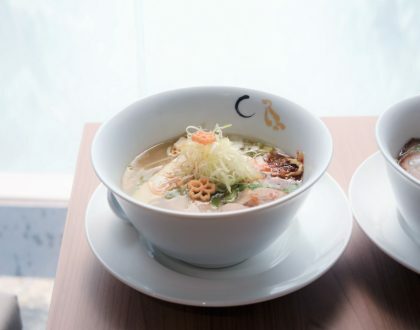 The serving good for 1 person, consists of a small cup of rice topped with slices of poached chicken, served with a garnish of cucumber slices, a side soup of chicken broth, and small bowl of the black sauce. 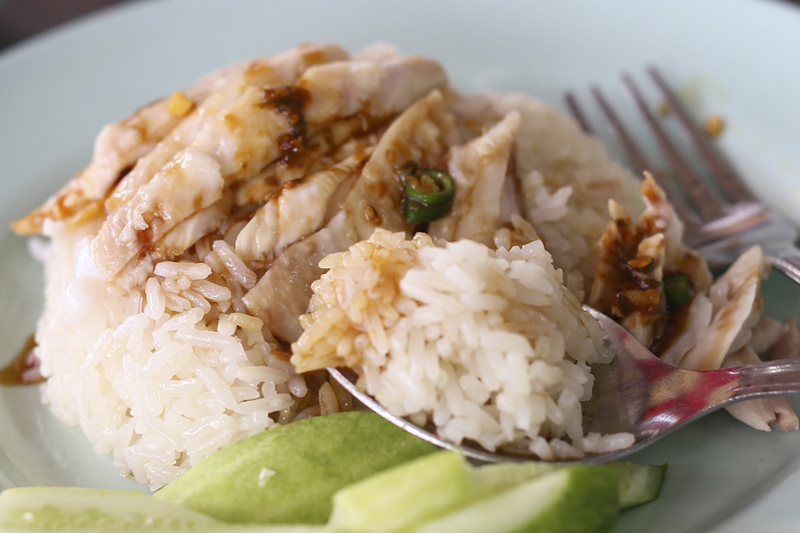 The Khao Man Gai (or Khao Mun Gai) is best enjoyed with this sweetish-soy sauce provided, drizzled moderately over the chicken if you find it too plain. 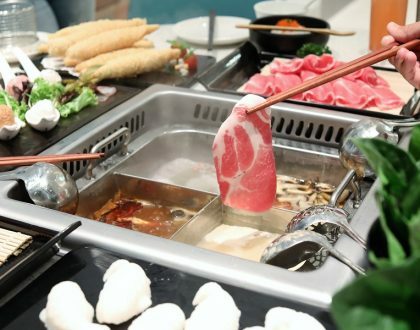 You can also dip your chicken in the black sauce made with soy sauce, Chinese black vinegar, ginger, and chopped bird’s eye chillies, appetising when mixed with rice. I thought that while the chicken meat was more or less average, the rice was flavourful, fluffy, and not too oily. To impart flavour and aroma to the rice, the grains were cooked in chicken broth and chicken fat. Yums. If you would like to order the chicken and rice separately, there is chicken good for 1 person (60THB, SGD$2.48), 2 persons (90THB, SGD$3.71), 3 persons (120THB, SGD$4.96), 4 persons (150THB, SGD$6.12), half chicken (350THB, SGD$14.46) or whole chicken (700THB, SGD$28.92). Aside from Chicken Rice, other recommended dishes are the Chinese Spring Roll (40THB, SGD$1.65), Grapaow Pla (Dried Fish Maw Soup) (50THB, SGD$2.06), and the Pork/Chicken Satay (10 pieces for 60THB, SGD$2.48). 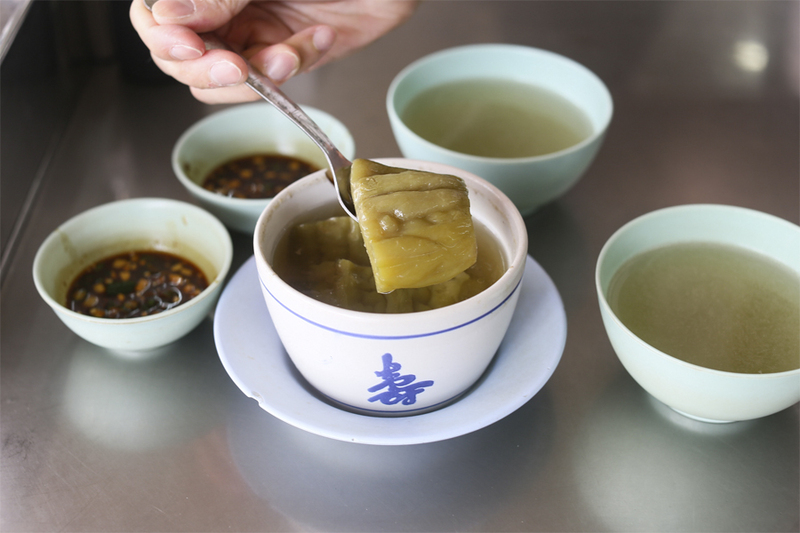 The Chicken Bone Soup is also favoured by many customers. 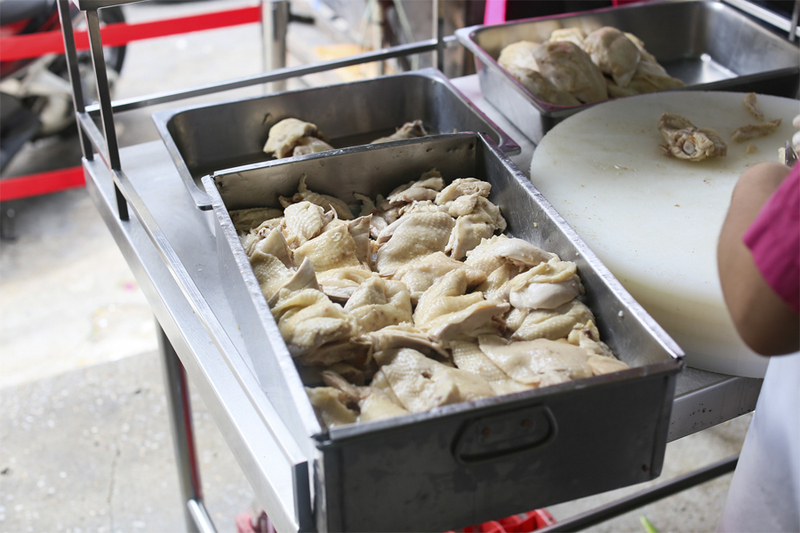 Boiled chicken gizzards and livers are also popular, and eaten with soy sauce. 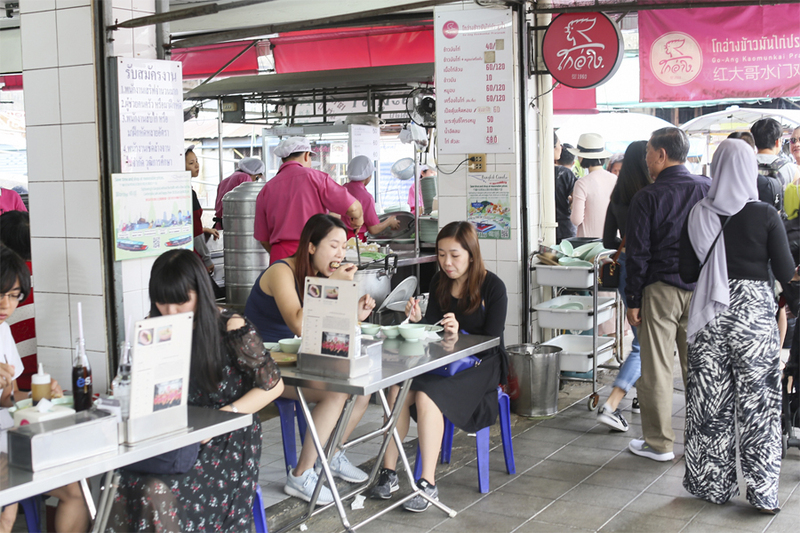 A small plate costs 60THB (SGD$2.48) and a large plate costs twice as much. Fans of their Hainan Chicken Rice Sauce can buy a bottle for 100THB (SGD$4.13). Buy 5 bottles and you get 1 free! Even if you arrive early, the place can get packed so be ready to wait for a table. You may have to queue for 15-30 minutes before you get a table. 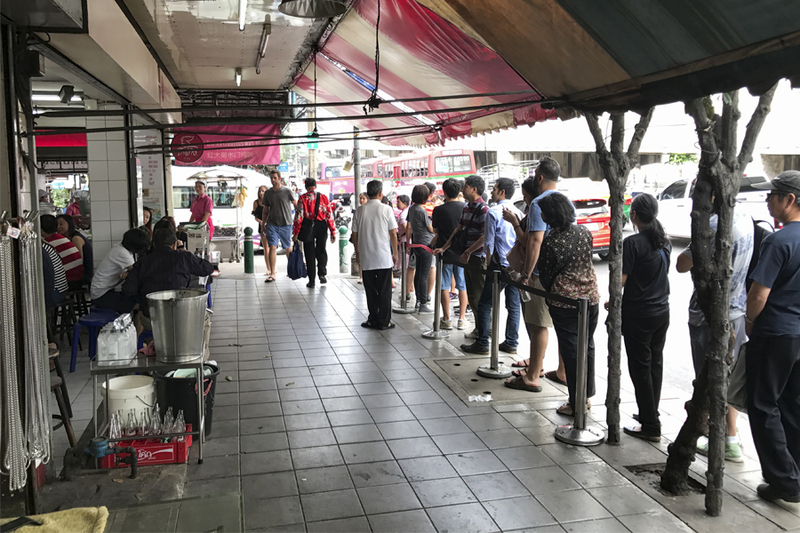 The place is located near the market, so the streets are crowded. It is best to get to the stall by tuk-tuk so you can avoid traffic jams during peak hours. Being singaporean, it’s abit pointless to post a chicken rice stall that’s just “wins several of the average stall here” so what you’re saying is that Singapore has better chicken rice. If that’s the case why do we have to go Thailand to eat it and why are you promoting it? And I’m here at the stall, because I didn’t read finish your post and only saw the headline. 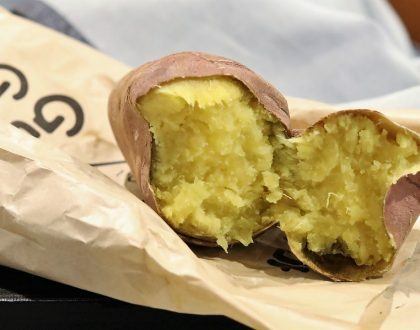 honestly an average Singapore stall will win hands down. The trip here was a waste of time which is fine. What’s more it’s a waste of stomach space.